If you want to know how to help a child with selective mutism, you’ve come to the right place. 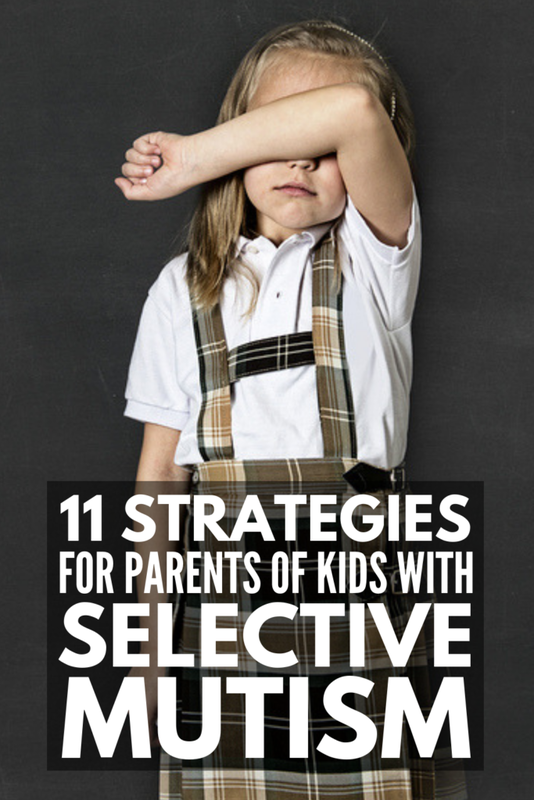 We’re sharing the signs, symptoms, and causes of selective mutism, as well as 11 practical ideas for those who want to know how to help a child with selective mutism at home and in the classroom. Selective mutism is a childhood anxiety disorder in which a child is only able to speak and communicate in settings where he or she feels comfortable and relaxed. Children with selective mutism often have a co-morbid social anxiety disorder, and while they can talk freely in environments where they feel comfortable (at home), they have a genuine fear when it comes to speaking in social settings (school, extracurricular activities, grocery stores and restaurants, celebrations with extended family, etc). As with many childhood disorders, the exact cause of selective mutism is unknown, but researchers tend to agree that a child is more likely to develop selective mutism if there is a history of anxiety within the family. Selective mutism effects girls more often than boys, and speech and language challenges can be contributing factors. Is Selective Mutism a Form of Autism? No. While it can seem like some of the symptoms of selective mutism (trouble with verbal communication and eye contact, for example) are similar to autism, the two disorders are very different. The symptoms of autism remain constant across different situations, whereas children with selective mutism adjust their behavior according to their level of comfort. For example, they may be extremely talkative and outgoing at home with mom and dad, and completely withdrawn and silent at school. 1) Educate yourself. If you want to know how to help a child with selective mutism, one of the very first things you need to do is educate yourself on your child’s diagnosis. The better you understand the struggles your child faces, the easier it will be to strategize ways to help him or her at home and beyond. Putting your head in the sand, pretending your child’s challenges don’t exist, and/or blaming yourself for the diagnosis isn’t going to benefit your child in any way, shape, or form. The sooner you reach a level of acceptance and equip yourself with the information you need to help your child thrive, the better. Talk with your child’s doctors and teachers, research online, join support groups, and read as much as possible. 2) Educate your child. Another often overlooked way to help a child with selective mutism is to be open and honest about his or her condition. Of course, this can be tricky if your child is too young to fully understand what selective mutism is, but if your child struggles to speak in some situations and not in others and deals with significant feelings of anxiety, he or she is probably very aware that something isn’t quite right. Your child most likely realizes his or her peers do not share the same fears, and may find relief in knowing the reason for his or her differences. 3) Make sure everyone is on the same page. Once you have a selective mutism diagnosis and a treatment plan in place, it’s important to ensure everyone who cares for your child is on the same page in order for treatment to be successful. Remember that consistency is key! 4) Create an honest, open, and accepting environment. Another very important tip for those who want to know how to help a child with selective mutism is to make sure your home is a safe place where your child can not only be him- or herself, but also share his or her fears and anxieties with you. The more honest he or she can be, the easier it will be for you and your child’s therapeutic team to understand what drives his or her selective mutism, and what the best method of treatment is. Selective mutism can be very lonely and isolating – not to mention frightening – for children, making it more important than ever that you create a loving and accepting home environment. 5) Think before you talk. Selective mutism can be extremely difficult and oftentimes frustrating for the entire family, and there will be times when your emotions get the best of you. It is during these times that you need to be very thoughtful and purposeful with how you react to your child. While your child’s fear of speaking in front of certain people and in different environments may seem silly at first, it’s important to remember that your child’s behaviors and emotions are not intended to upset you or ruin your day, and he or she would likely give anything not to have selective mutism. Take a 5-minute time out to compose yourself when you start to become frustrated, and on the days you do get upset, take the time to discuss the situation with your child after you’ve calmed down so the 2 of you can brainstorm strategies to ensure history doesn’t repeat itself. 6) Don’t use bribes. As tempting as it may feel to offer a huge reward to get your child to speak, bribery simply doesn’t work with children who have selective mutism. Begging your child to talk to you isn’t going to make a lick of difference, and promising him or her a toy or other reward can actually be extremely unfair. Selective mutism isn’t a choice. It’s an anxiety disorder that is completely out of your child’s control, and it’s important that you remove any and all expectations about speech in order for your child to build up his or her confidence and make progress. 7) Teach mindful breathing. When anxiety strikes, your child’s breathing pattern will change. Often, he or she will begin taking short, fast, shallow breaths, which can make him or her feel even more overwhelmed than he or she is already feeling. Mindful breathing is a great tool you can teach your child to use when their emotions threaten to take over their bodies. There are many different mindful breathing techniques you can try, and I suggest starting with the Bubbling Blowing Technique. When your child is calm, give him or her a small container of bubbles so he or she can practice blowing bubbles with a wand. You child will quickly learn that if he or she blows too hard or too fast, the bubble will burst before it has time to take shape. But by blowing slowly and with purpose, he or she can blow a perfect bubble. Have your child practice the technique with real bubbles before removing the bubbles and letting him or her use only his or her imagination. Once this skill is learned, you can ask your child to ‘blow pretend bubbles’ when you sense your child feeling overwhelmed. 8) Work closely with your child’s teachers. Educate your child’s teachers about selective mutism, engage in regular discussions and follow-ups about your child’s behavior and progress at school, and make sure an IEP is put into place so special accommodations can be made to support your child’s needs and treatment plan. 9) Volunteer in the classroom. Most kindergarten and elementary classrooms ask parents to volunteer on a regular basis to read with students, help setup crafts, and assist with other activities and events. If your schedule permits, this is an excellent opportunity for you to spend time with your child in a setting where he or she feels uncomfortable. Your child’s therapist will likely have recommendations on how you can use this time to help you child work towards being able to speak with a familiar person (you) in a stressful situation (school). Keep in mind this will be a lengthy process, and try not to get discouraged if progress is slow. 10) Organize playdates! Another tip for those who want to know how to help a child with selective mutism is to organize regular playdates. Even though your child may not speak at school, that doesn’t mean he or she isn’t forming bonds with his or her peers, and one-on-one playdates offer a great opportunity for your child to socialize in a setting where he or she feels more comfortable. You may need to supervise and facilitate the playdate, but as long as you keep an open mind, remove any and all expectations from your child, and plan out some fun activities ahead of time, it won’t be as difficult as you think. 11) Be there. My last tip for those who want to know how to help a child with selective mutism is to simply be there. Selective mutism is a very real, isolating, scary, and difficult thing for anyone to deal with, let alone a small child. It’s important for your little one to have a safe place where he or she can be open and honest, and that he or she knows you are always on his or her side. Figuring out how to help a child with selective mutism isn’t easy, but I hope these tips and ideas help you gain a better understanding of the disorder, and inspire you to find ways to make things easier for your child. As emotional, frustrating, and difficult as it can be, selective mutism is a real thing, and it can be extremely scary and overwhelming for a small child to experience. And while our job as parents is to find ways to help our little ones function in the world, there comes a time when we need to think outside the box and figure out different strategies to help them cope with things you may never understand. If you’ve been on the hunt for tips to help you figure out how to help a child with selective mutism and found the ideas in this post useful, please share this post on Pinterest! And if you’re looking for more tips to help children with anxiety disorders and other developmental delays, please follow our Special Needs Parenting board where we share all kinds of helpful information we find each day.